Omnichannel retail is the process of integrating multiple offline, online sales and marketing channels to deliver a unified shopping experience. This results in a convenient and seamless experience for customers. 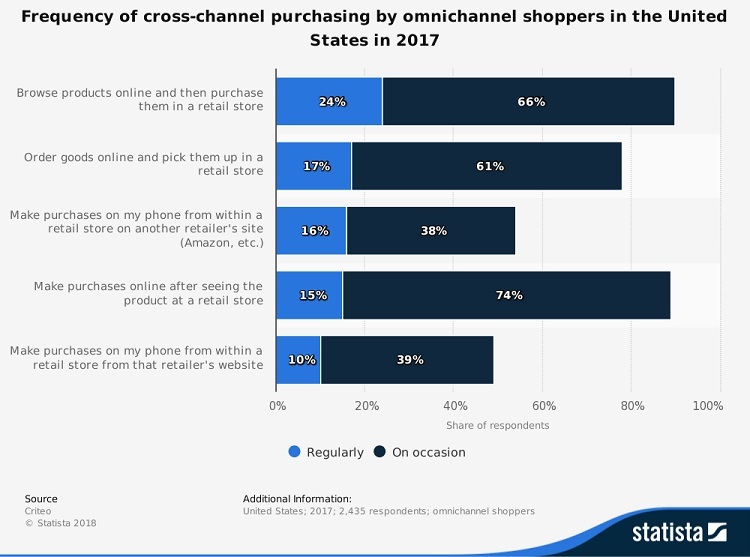 The below graph shows the cross-channel purchase frequency in the United States by omnichannel shoppers in 2017. In simple terms, the interactions of the customer with the business through a number of channels will be connected. This includes integrating online, POS systems, mobile app, in-store, email, various social media networks and so on to boost business. Google’s report says that almost 52% of the online retail stores in the US have omnichannel features. 72% rate that integrating e-commerce and in-store purchases are critical for businesses, according to a report from Amasty. The aim of omnichannel is to place the customer at the centre of all the activities instead of the product or other channels. Multichannel retail is providing multiple ways for your customers to shop the products. This may sound a bit complicated but in reality is not. For example, if you are someone who sells products on the website, mobile app, Facebook shop etc, then you are already a multichannel seller. In simple terms, multichannel retail is reaching out to customers on two or more sales channels. The aim of multichannel retail is to provide a shopping experience in a medium which is most comfortable for the customer. Important note - Multichannel retail is often considered as an advanced version of single-channel retail. This is because if one channel does not work out as expected, other channels can help. For instance, if a business is only selling on Amazon and if the seller's account gets blocked then sales, revenue, and customer reach will be lost. This might bring the business to a halt. The best solution for this is selling on multiple platforms, i.e. multichannel retail. Businesses that sell on multiple platforms such as Amazon, eBay, Etsy, Facebook Shop and so on have higher chances of success rate in the long run. Also, each platform has a specific set of customers, and hence multichannel retailing will bring a wider reach for businesses. Multichannel and omnichannel are not entirely different concepts. For example, multichannel selling is a part of omnichannel retail but not the whole. Most of the aspects of multichannel retail should be interconnected to create an omnichannel experience. If you are still unclear, here are some real examples. Neiman Marcus is a luxury retail chain which is using Omnichannel in an intelligent way. Consider if a customer searches for a medium size jacket on the website. The search details will be saved. When the customer searches for the same item next time, results for medium size which are available in the nearest market will be displayed using the geolocation of the customers. In addition to that, the company uses geolocation to send out emails directly about the latest arrivals and local events based on customer's interests. Abercrombie and Fitch is an established American retailer focusing on upscale casual wear. It has over 1,049 stores and also maintains two other brands – Abercrombie Kids and Hollister Co.
Providing options for customers to search and buy online, and pick up in-store. Customers can return products from various channels and customer service can be reached via two or more channels. The cart will be updated across various devices. For instance, if a user adds a pair of shoes in their cart on their laptop, they can process from the same step on their mobile. Customers are ready to pay 16% more in return for better customer experience. First, know your customers' preferred channels. Before setting up an omnichannel customer service system, you have to know the most preferred channels of your customer. Do the customers directly come to the website to find their answers? Or they opt for the official Twitter business account to reach the customer? Or they call the customer care service directly? Relevant research and deep analysis should be done on the target audience. Only after that, the channels should be selected. Every customer expects a faster response. But if you are maintaining multiple channels, is it possible for you to deliver a faster response? Well, it is possible with omnichannel implementation. Either a team can be assigned to take care of the customer responses or you can use automated tools to deliver pre-defined answers. The crucial thing that you should have in mind is to respond to customer queries based on importance. Since you will be notified of customer questions from different channels, care should be taken to respond to the queries that require immediate action. Consider this scenario: A customer has bought a new laptop and faces an issue. He contacts the customer care via phone and explains the problem. Since it is too technical, the customer care connects the call to the engineering department, and the customer has to explain everything once again as there is no record of the issue. After a week he faces the same problem and contacts the same customer care number. But, the call is picked up by another customer care employee and the customer is asked to explain the problem again. In fact, 84% of consumers are frustrated when the agent does not have information. There is a good chance that every one of us has already faced this issue, and still, this exists because of the lack of customer record. Set up your omnichannel customer care along with customer records to improve customer satisfaction. By having the record of customer history with the business, and tools to access and use multiple channels simultaneously, the waiting time for the customer can be reduced. With omnichannel, businesses can swiftly take care of customer issues along with a deep understanding of the issues. 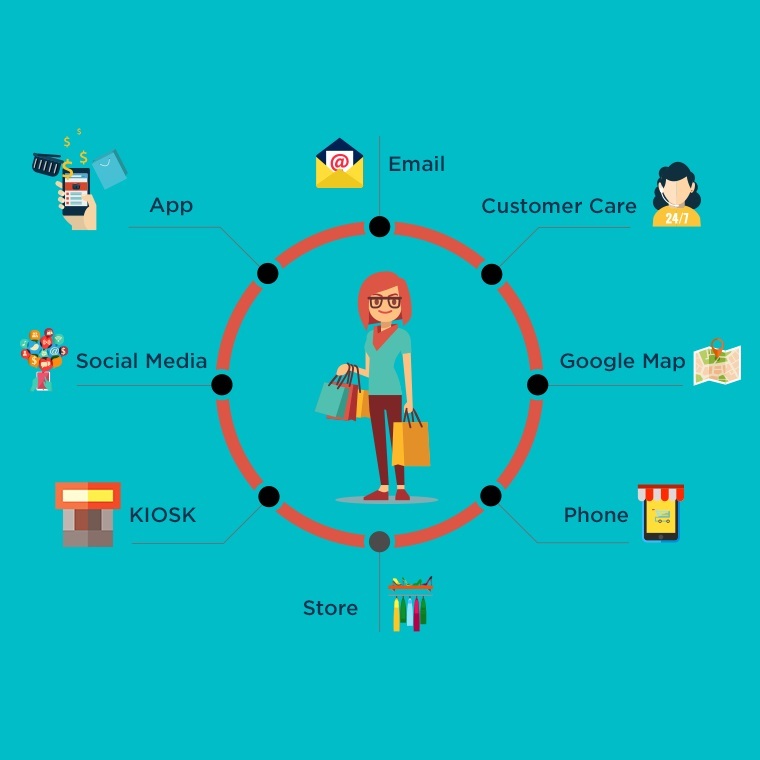 Similar to omnichannel customer service explained above, omnichannel marketing also benefits from “connected service”. Email Marketing, even now, is one of the effective ways to reach customers. E-commerce platforms like Magento have a built-in email marketing tool that can help business to grow effectively. Email marketing works the best when it is driven based on sales data. Target emails can be sent to customers who have purchased particular or similar products. Using purchase history and targeting emails accordingly is one way to get maximum results from email marketing. For example, if your customer purchases a new phone, then there is a high chance for them to buy a phone case. An email containing suggestions for mobile cases along with an option to directly add to the cart can improve sales as well as customer satisfaction. Starbucks is one of the leading brands that is using loyalty programs in a magnificent way. Starbucks is a world-renowned brand that has implemented omnichannel to bring more convenience to its users. There is a dedicated Starbucks rewards app which customers can use to pay, track their rewards points, find stores, order on the way and do many more. Customer will be handed over a free rewards card that can be used whenever a purchase is made. The customers can check and reload their card using the app, website and in-store. Any changes to the card and the customer profile will be updated on all the channels. Retargeting ads are also widely used by a number of businesses. If you don't have any clue about retargeting ads – when you leave a website and later see ads from the previous website on the current websites you visit – those are retargeted ads. Retargeted ads can also comprise trial offers or discount coupons to increase customer interaction. Social media is where most people spend a lot of their time. Therefore it is not wise to leave the social media networks untapped. Select the right platforms that will suit the best for your business and your customers. Social media helps in unique brand personalization and enhanced targeting which are two important elements that can grow a business. Learn how to use social media marketing for online stores. Which one should I choose? Multichannel or omnichannel? Therefore it is highly important to select and implement the right method. Omnichannel is more like an advanced version of multichannel and the advantages of the former clearly overtakes the advantages of the latter. If you have already planned to implement omnichannel in your business just make sure you get the most crucial thing right - custom building and using an omnichannel system that matches the nature of your business and customers.